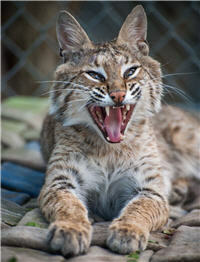 A resident in Rockwall called Animal Control because they had a bobcat looking through their doors and windows like he really wanted to come inside. 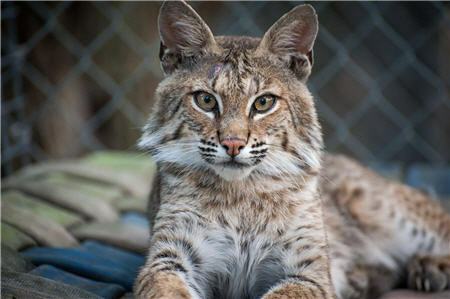 Rockwall picked him up and they believed he was someone’s pet who was abandoned or escaped. We took him in so we could watch him for a couple of days to make sure he wasn’t sick. We also called in a rehabber to asses him and they came to the conclusion that he was very likely a pet. He is not frightened of people and is very relaxed. Because he shows no fear and readily approaches people and houses, he would very likely be harmed if released. Goliath is in fairly good shape, but a little thin. He had a few sores on him and his ears were pretty beat up, but he’s eating anything put in front of him, including canned cat food. He did have some ticks on his ears but allowed our staff to remove them. Goliath seemed to be used to being touched and didn’t mind us treating him for the ticks and fleas. We were also able to put antibiotic ointment on his sores. 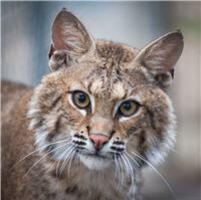 After a quarantine period Goliath was moved to the York enclosure along with 5 other bobcats. He is eating a good diet and Chance have become quite the buddies, they are often seen laying around with each other on the bridge. We are happy to have this little cutie be a part of our In-Sync family.